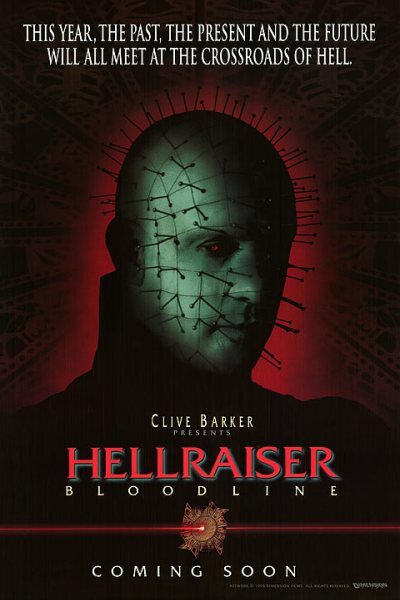 Before Hellraiser made the straight-to-video jump, Hellraiser: Bloodline was known as both the most and least ambitious entry in the series, literally reaching for the stars in terms of premise while pandering to the lowest common denominator in application. The director is credited as Alan Smithee, short for “Kevin Yagher doesn’t want his name associated with this fiasco”, but really we’re looking at the confused brainchild of a committee refusing to understand that going back to the roots of a cult franchise and knocking off the most recent commercial success are deemed mutually exclusive. I should explain what Yagher and screenwriter Peter Atkins had initially intended: three tales mapping out the past, present, and future of the Hellraiser universe as experienced by Philippe LeMarchand’s bloodline. Specifically, the stories would have covered his creation of the Lament puzzle box during French Enlightenment, the Cenobites’ conflict with hell’s old guard in the modern day, and their final ordeal in 2127. In essence, the filmmakers thought they could bring the franchise back on track, all the while expanding its mythology. Instead, we get some nonsense about a scientist named Paul Merchant (Bruce Ramsay) hijacking a space station to avenge his ancestors. Narrating two extended flashbacks, he tells of a four-hundred-year-old grudge with a demoness called Angelique (Valentina Vargas) and then switches archenemy halfway through because, you know, Pinhead’s the bloke on the posters. The basic premise of each chapter remains more or less the same, but the through line has been retooled to make the Cenobites more prominent, whether or not their presence serves the story. It’s too bad because Angelique might have made an interesting new antagonist if the producers hadn’t been so eager to show us that guy we’ve seen in three other movies. I like the way she schemes around her earthbound restrictions, telling her masters, “A summoned demon is yours to command unless you stand in hell’s way,” all the while hiding hell’s agenda. Unfortunately, her origin story in eighteenth century France feels somewhat rushed, not just in terms of pacing but in execution as well: the sets feel drab and constrictive, making it hard to decipher what’s going on, and, let’s face it, Valentina Vargas is no Clare Higgins. That is, until the final act, in which Paul and astro-cop Rimmer (Christine Harnos) team up on the Minos station to unleash the Elysium configuration on the Cenobites. Call me old-fashioned, but I feel mystical horror and space-faring sci-fi don’t mix. Granted, the combination worked in Event Horizon (1997). However, that flick had, you know, imagination. This one plays like a perfunctory entry in a generic slasher series that’s long jumped the shark: monster returns; monster picks off supporting cast one by one; virginal heroine stops monster, this time with lasers! Miramax even advertised the film as the last chapter in the Hellraiser saga, no doubt to follow suit with Freddy’s Dead: The Final Nightmare (1991) and Jason Goes to Hell: The Final Friday (1993). The payoff to this claim strikes me as somewhat of a cop-out, what with the endgame set in the far-off future, making it easy for further instalments to ignore. 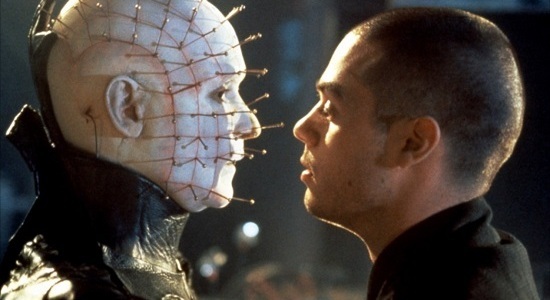 More to the point, Hellraiser: Bloodline had genuine potential, but I get the impression that, if Freddy and Jason jumped off a bridge, the studio heads would drag Doug Bradley in chains and throw him into the abyss.